Afghanistan's President Ashraf Ghani speaks during a live TV broadcast at the presidential palace in Kabul, Afghanistan, Jan. 28, 2019. When Afghanistan President Ashraf Ghani laid out the red carpet in 2017 for controversial Afghan warlord Gulbuddin Hekmatyar — once known as "the Butcher of Kabul" for his role in the bloody conflict for the control of the capital in the 1990s — many thought he was trying to isolate the central Taliban leadership by luring factions to break away and join the government. It didn't work. Today, the Taliban seem to have turned the tables on him — with Russia's help. "The real significance of Moscow, in my view, is that it has somewhat isolated the Afghan government," said Richard Olson, a former special representative for Afghanistan and Pakistan for the United States. US Special Representative for Afghanistan and Pakistan, Ambassador Richard Olson speaks during a press conference at the US Embassy in Kabul, Dec. 6, 2015. 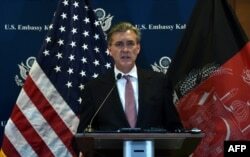 Olson was referring to a two-day conference in Russia this week that included a 10-member Taliban delegation and almost 50 influential Afghans, including politicians, former jihadi leaders, civil society activists and former President Hamid Karzai — but no representative of the Afghan government. Pictures of the conference showed Sher Mohammad Abbas Stanekzai, the head of the Taliban delegation, standing shoulder to shoulder with Karzai and other Afghan leaders, many of them Ghani's political rivals. 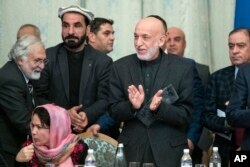 Former Afghan President Hamid Karzai, second from right, applauds during the intra-Afghan talks in Moscow, Feb. 6, 2019. President Ghani's anger about the meeting was obvious from various statements, in which he called it an academic exercise by those with "no executive authority." Amrullah Saleh, Ghani's running mate in upcoming presidential elections, in a tweet warned conference attendees of becoming "useful idiots" by reinforcing the narrative that "we are a web of tribes and not a state." The Ghani administration has also lodged a complaint with the United Nations against the Russian government for allowing Taliban leaders, some of whom are on a United Nations Security Council sanctions list, to travel. Those who attended defended the meeting. "The process here in Russia will further strengthen the negotiation of Khalilzad," former Balkh province Governor Atta Mohammad Noor told The Washington Post. 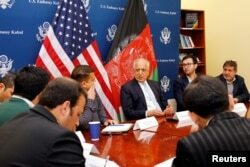 Zalmay Khalilzad, the U.S. special representative for Afghanistan reconciliation, has been talking to the Taliban for several months. In January, he held a marathon six-day meeting, which both sides termed as positive. However, despite Khalilzad's pressure, the Taliban have so far refused to include the Afghan government in the negotiations, or even meet their representatives directly. Afghan political analyst Mushtaq Rahim said there was a backlash in Afghan civil society against those who attended. Sami Yousufzai, a journalist who has covered the region for years, said the Taliban have managed to drive a serious blow to the impression that the country was united against them or standing behind Ghani for peace talks. They got "the biggest advantage" out of this meeting, he said, whereas Ghani appeared to be "totally isolated." The situation also suited Russia, which for at least the past two years has been trying to exert its influence in Afghanistan. Russia's biggest fear, many analysts agree, is the presence of Islamic State in Afghanistan. It sees the Taliban as a hedge against IS, which has a global jihadi agenda and could influence the Muslim population in Russia and the Central Asian states in its backyard. Russian Foreign Minister Sergey Lavrov, second left, speaks as he attends a conference on Afghanistan bringing together representatives of the Afghan authorities and the Taliban in Moscow, Russia, Nov. 9, 2018. A day before the Moscow meeting, Russian Foreign Minister Sergey Lavrov accused the U.S. of holding talks in secrecy and leaving the regional countries "in the dark." 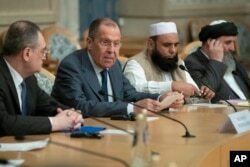 He also said Russia wanted an intra-Afghan dialogue that included the Afghan government. "For Moscow, its initiative represents an effort to get closer to the elusive intra-Afghan dialogue that all sides keep talking about," said Michael Kugelman, deputy director of the Asia Program at the Washington-based Wilson Center research organization. Although he warned that without bringing in the Afghan government at some stage, this process would only "work against" the rival process between the U.S. and Taliban. FILE - U.S. Marines stand guard during a change-of-command ceremony at Task Force Southwest military field in Shorab military camp of Helmand province, Afghanistan, Jan. 15, 2018. Olson was also skeptical of the Russian intentions, calling them "potential spoilers." 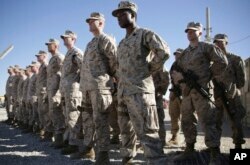 "Their objective, even more than the Taliban's, is the withdrawal of U.S. forces," he added. Thomad Ruttig, of the Kabul-based research organization Afghanistan Analysts Network, agreed, calling the Moscow conference an effort by the Russians to "divide and interfere." Technically, the conference was not a Russian government initiative. It was organized by theCouncil of Afghan Society, a Moscow-based organization of the Afghan diaspora. President Ghani's administration was invited to a previous conference in Moscow organized by the Russian government, but the Afghan government declined because the Taliban refused to meet their representatives. The Taliban's refusal to engage with the administration was more than just stubbornness on their part, said analyst Rahim, who thinks if they sit with the administration, conversation would likely shift to how they can integrate into the system rather than "taking over the system." He also thought the Taliban were hoping to undermine the administration so much that in the end they would negotiate on their terms.